Posted April 30, 2018 & filed under Fun Stuff, VOLCANO DREAMS. Just added 25 page critique by Linda Camacho at Gallt & Zacker Literary Agency. Linda is looking for MG, YA, and adult fiction across all genres and will analyze the critical first 25 pages of your novel, defining its strength’s and identifying ways you might improve it or make it more salable. Handmade VCFA Afghan crocheted by VCFA’s very own Angela Paladino. Lovely, cozy, and full of VCFA pride! Spend three days at a VCFA residency! This is your chance to experience what another program residency is like. Accommodations at VCFA and meals included, if desired. [Dates must be agreed upon by winner and Program Director; excludes the two residential programs]. Tea for two with Katherine Paterson. 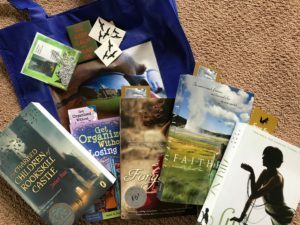 Spend time with the incredible author herself at her home in Montpelier, VT.
I’ve donated to this auction because I so love my alma mater and want to support her, and you can find my auction item here – a bunch of books and cool swag. I can personalize the books for you or your gift recipient (your kid’s teacher, maybe?) 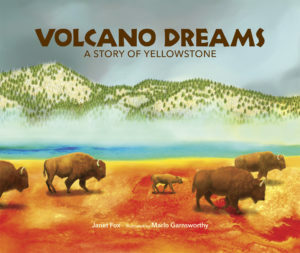 And because I love the school so much, I’m adding a last minute item – a hot-off-the-presses first edition hard-cover copy of my not yet released picture book VOLCANO DREAMS! But don’t wait – there’s less than a week left to bid! Don’t miss this chance to get some wonderful stuff, and benefit VCFA!